I folded a piece of card in half, then took an old CD to create a template for an easel card. I printed a football the same size, from a cd, and the world cup was a down load from the-paper-craft-tutor. I made the base green for the pitch, and did the writing in red to support England. 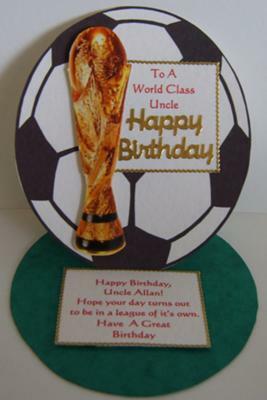 This is for my Uncle who's birthday is while the World Cup is on. What a clever card and a very appropriate theme for your uncles card Margret, I hope he liked your creation. 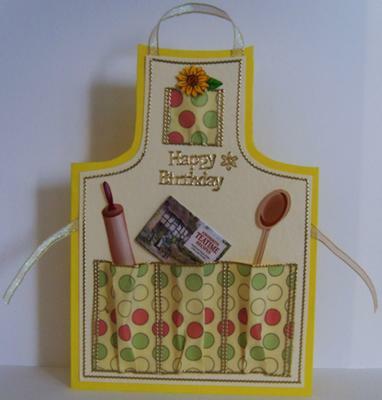 It is good to make cards with different themes, it all helps to keep the old brin box working. Thanks for sharing Margret. This card is for my Father-In-Law, who loves to garden, and loves roses. 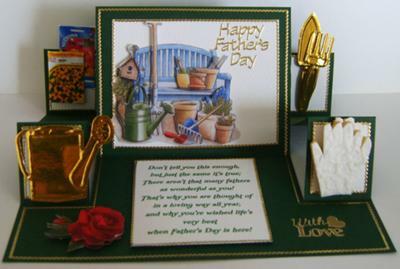 The gardening tools and the watering can are made from the "Keepsake" Media'n Pastimes embossing board. I scanned the seed packets and then reduced the size. The gloves are foam covered with textured paper. The garden bench and tools are a down load, and then decoupaged. The verse I found on the internet. What a very enterprising lady you are, and the card is lovely. I'm sure your father-in-law will be delighted with it. Thank you for sending the photo in Margaret, and for the instuctions on how you put it together. 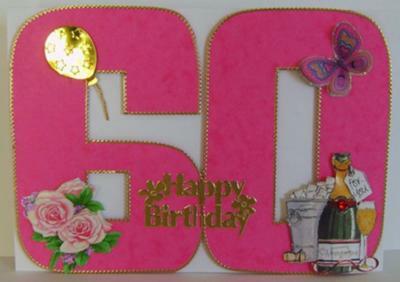 This card was created after making a template on Word for the 60. I decoupaged the rose, and the champagne and glass were taken off another birthday card. I photo copied it, so I could reproduce it on other cards. I added the happy birthday peel off, a butterfly and a balloon. Lovely card Margaret and a good way to recycle stuff and save money in the process. This card is for my nephew. I created a side step card, and I designed the backing paper by going to www.freecraftstuff.co.uk build your own backing paper. For the 21 I used "Word" to create a template, and the images are taken off the internet. This is very original card Margaret and I am sure your nephew was thrilled with it. 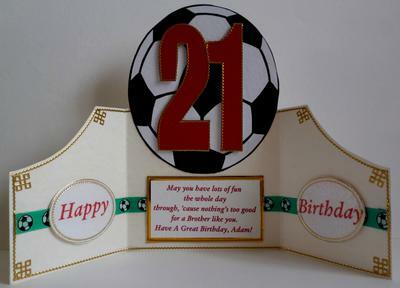 It would suit all age groups and is a really good idea for those difficult male themed card. To create the shape of this card I went to "More Projects" on the Card Making Magic site and followed the Double Side Step Card instructions. My nephew has two passions which are music and Xbox, so I made the theme for this card Music. Another lovely submission from the talented Margaret. 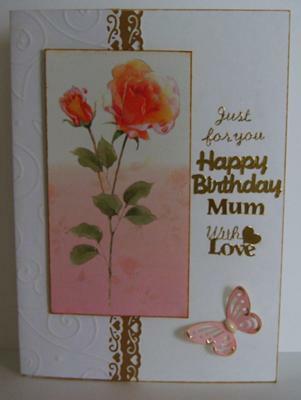 I am so pleased you found the tutorial on my website for this card useful, keep up the good work. This is the same templates as the gardening apron. I scanned a recipe book and reduced the size to fit into the pocket. The rolling pin and wooden spoon are the images off a crafting CD. I added a smaller pocket with a sunflower in it. 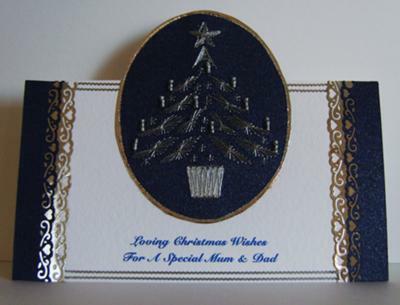 Another lovely card and one that I am sure will be copied by other visitors to the website. I followed the instructions on your video tutorials to create this easel card. I found the demonstration very easy to follow. 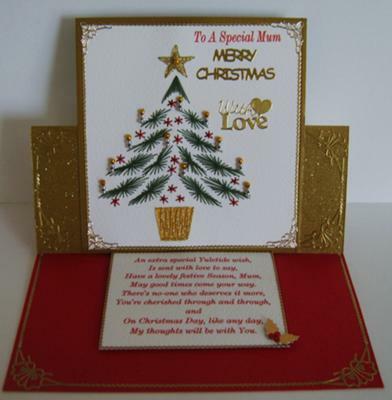 I am so pleased you found the tutorial easy to follow and the card is a credit to you. Thanks for sending it in. I created 2 templates in the shape of an apron, making one slightly smaller to fit on top of the larger one. This helped me to sandwich the ribbon for the neck and the side ties. The gardening tools are made from the "Keepsake" "Media 'n Pastimes" embossing board. I scanned a seed packet and then reduced the size to fit the pocket. The gloves are foam covered with texured paper. Christina says... Very inventive Margaret and a lovely card. The rose was off an old birthday card. 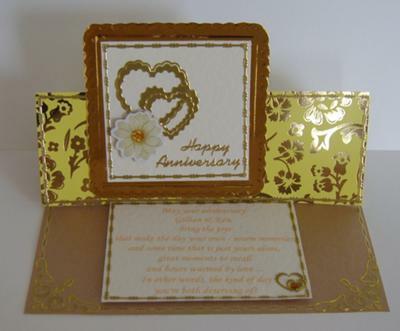 I edged it with a gold ink pad, then did the same around the edge of the card. I used a punch for the border and butterfly. Another very pretty card from you Margaret, thank you. I love the embossing under the rose, it really adds depth to the background. I used silver metallic thread for the tree and added white beads for the candle. 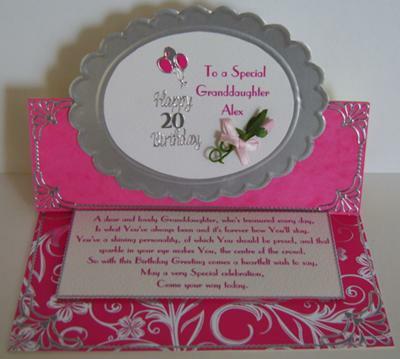 The oval was created using the Glitter Girls "Celebrations" Embossing board. I used a punch to create the borders and finished them off with 2 rows of peel offs. What can I say Margaret...yet another lovely card from you. I am sure the parents that recived this card were truly delighted with it. This card was made for our friend Gary, who is blind, for his girlfriend for Valentines Day. Shapes and textures where important in the making of this card. Lucky man to have you to make the card for him Margaret, and lucky lady to receive the card from Gary. Beautiful result. I created an easel card. I used a textured red card for the base, and gold glitter card for the stand. Metallic thread was used for the base and star, and normal green cotton for the branches. It is finished off with peel offs and gold holly. Textures and shapes are important on this card, because it was made for our friend Gary (who is blind) for him to send to his Mum at Christmas. Another lovely card Margaret thank you for sending it in. 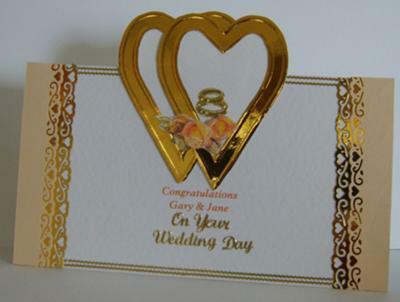 The Romance Embossing board from the Glitter Gilrs was used to create the hearts. I then used my heart punch to create the borders, and the roses are decoupaged and then finished off with gold peel offs. 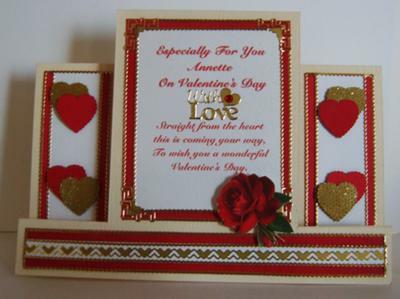 This a beautiful card Margaret and really fits the bill for wediing. The embossing boards can help to produce some fabulous results, and there are a lot of them to choose from. 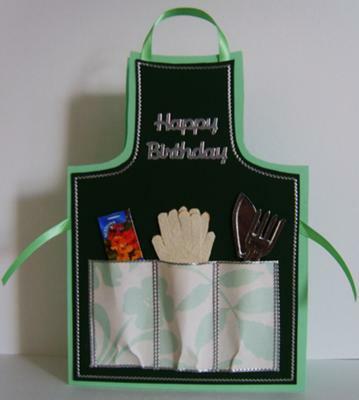 I was asked to make this card, and I created an easel card from the instructions in "Easy Projects" on this website. The scalloped oval was made using the Glitter Girl "Majestic" embossing board and I found the verse on the internet. I finished it off by adding a few peeloffs. Another lovely card Margaret. I have several Glitter Girls boards and they make some really good embellishments to add to your creations. 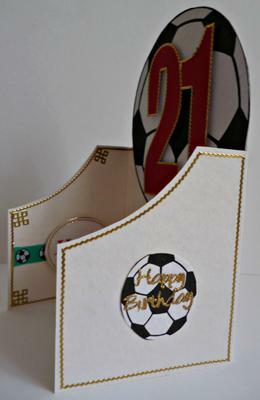 Used the template which Emile (USA) kindly shared on her gate fold card with telescoping ball card. I copied the template on my computer to fit a A4 sheet. 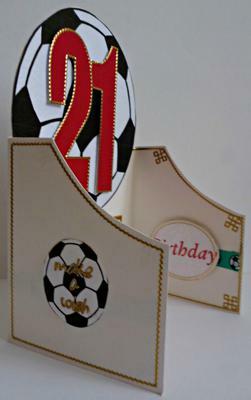 Put the template on a cream card and cut round it, then edged with gold peel offs, used green ribbon with footballs on and printed a big football on white embossed card for the centre. 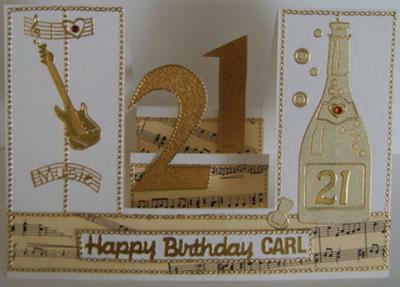 I Had a template for a 21 and edged in gold peel offs, printed Happy Birthday on white card and covered with oval peel offs. Printed verse off and backed with gold card. When closed edged again with gold peel offs, and used smaller footballs one with make a wish and the other with Happy Birthday. 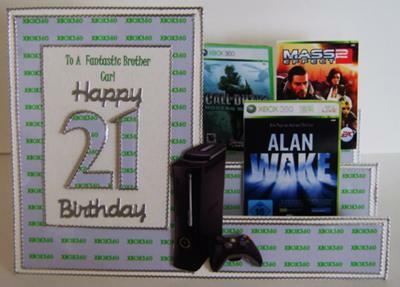 This was made for my Nephew 21st Birthday. An easy template to follow did not take long to create. How wonderful of you to use Emilies' template and what a fantastic job you have made of it. It was very kind of Emilie to add the full instructions for everybody to follow and they are very full and easy to see.